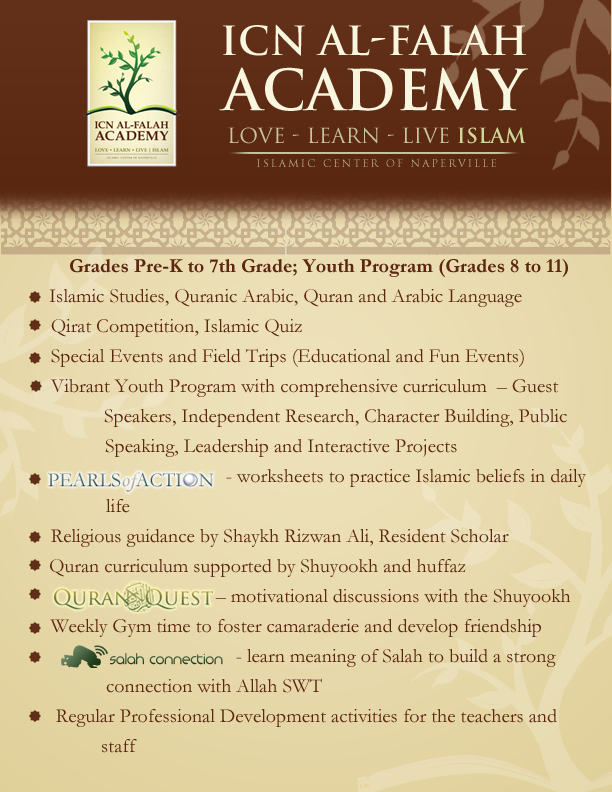 The Islamic Center of Naperville Al-Falah Academy serves the communities of Naperville and surrounding towns to impart knowledge of the Quran and the Hadith to our youth to make them good role models and obedient servants of Allah (SWT). Our curriculum is designed with a strong focus on Quran, Arabic and Islamic Studies with appropriate instruction for each grade level. Our regular classroom instruction is supplemented with field trips, special events, and guest speakers. We have an interactive youth program for our older students, which includes classroom discussions, workshops, community service, and guest speakers. We also facilitate various adult education programs by providing classes on Arabic, Parenting, and Networking for Professionals. Our dedicated team of teachers, teaching assistants, and volunteers devotes their time and effort to provide an environment for all to learn, love, and live Islam.